If you have lost all your teeth, there are various treatment options available. One option would be the placement of a removable denture. A denture sits loosely over your gums with no secure connection to your jawbone. Dentures are the cheapest method of tooth replacement, but they are hardly replacements for natural teeth. 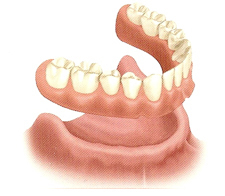 A removable denture is custom fitted to each patient’s jawbone. But as it shrinks over time, the removable denture becomes loose. This movement may cause soreness of gums, difficulty in chewing, and trouble speaking. Over the years, the denture may need remodeling, so that it fits the changing shape of the jaw. This can be very frustrating for a patient who experiences this cycle of denture maintenance for many years. With bone loss, it becomes increasingly difficult to stabilize the denture. The remaining bone may not be thick enough to protect one of the jaw’s main nerves from the pressures of biting and chewing. This type of pressure may cause extreme pain and discomfort. The only proven way to prevent or stop bone loss is to replace your natural tooth roots with dental implants. If you would like to learn whether you are a dental implants New York City candidate and how this procedure can help you achieve a healthy smile, schedule a personal consultation by calling Advanced Periodontics & Implant Dentistry at or contacting us through our website here. Jaw bone will shrink and may leave main nerves unprotected from the pressures of biting and chewing. Advanced Periodontics & Implant Dentistry is a state-of-the-art dental practice offering leading-edge restorative and gum treatments. If you would like to consult with an experienced New Jersey periodontist or dental implant provider, please set up an appointment.